Thomas Hutchinson (1711–1780) was the last crown-appointed civilian governor of Massachusetts. During his term of office, he dealt with the aftermath of both the Boston Massacre and the Boston Tea Party. The Colonial Society of Massachusetts has recently published the first volume of his selected correspondence covering the years 1740–1766. It is most readily available through amazon.com. Here are further thoughts about the process of documentary editing by John Tyler, one of the volumes’ two co-editors. It is often said that transcription (translating eighteenth-century handwriting into Microsoft Word) is about one-third of the work involved in documentary editing. For the Hutchinson papers, Malcolm Freiberg and Catherine Shaw Mayo had already established, in a preliminary way, the text of most key letters. Elizabeth Dubrulle and I would be negligent, however, if we did not check these against the originals, but Freiberg was very rarely wrong. Elizabeth and I do have the advantage of being able to see the originals, since his letter books have been disbound by the state Archives; thus, some words that trailed off into the margins are now more readily apparent. Digitization also allows modern transcribers to blow up puzzling words and letters to an enormous size so that they may be more readily deciphered. Other riddles depend on understanding eighteenth century usage, to which one’s ear eventually becomes attuned, just as the historical novelist will want to read lots of Jane Austen to make sure the dialogue sounds right. The gold standard in establishing an authentic text is double-blind proofreading, where two people sit side by side, one reading aloud the original text while the other checks the transcription. This is more easily described than done because of the need to preserve the original spelling, capitalization, and punctuation, the rules concerning all of which have changed considerably since the eighteenth century. Thus tools like spell checking and autocomplete are not the friends but the enemies of the documentary editor. Many eighteenth-century authors wrote a first draft in their letter books, allowing a scribe (or in Hutchinson’s case, his children) to make a fair copy that would be dispatched to the recipient. One of the very first phases of any letters project is to gather all the existing copies of a letter for comparison, and for someone as compulsively circumspect as Hutchinson, the differences between the various copies are often enlightening. In almost all cases, the recipient’s copy provides the printed text, since those were the words that were read and acted upon. We usually note differences among the copies in the notes, although in some cases we have actually printed two versions of the same letter, since his unguarded first thoughts make much juicier reading. Annotation, which Freiberg and Mayo had really just begun when their work stopped, is the part I most enjoy. It is exactly like working on a jigsaw puzzle. The first reference to a person or event may not be exactly clear, and many times, if the editor is patient, the mystery will resolve itself a few letters down the line. Thus, “old Warren” – who may be any resident named Warren living in Hampshire County, Massachusetts – will eventually be revealed as Seth Warren, one of the so-called Berkshire Rioters, who attempted the rescue of a friend imprisoned for debt during the period when all the courts were closed because of the Stamp Act. A good memory also helps to identify unnamed correspondents (of whom there are many in the Hutchinson Correspondence) when something said in one letter matches with something said in another. In certain instances, Hutchinson may deliberately leave a name blank or refer to an individual only by his initials, as a safeguard against charges of libel or protection against prying eyes at a time when letters were frequently opened by curious individuals while still on their way to the addressee. Here it helps to know the cast of characters or the way he habitually refers to them, as in “my chief adversary” or “the principal demagogue in the province” by which he almost always means James Otis, Jr. Just like working on a jigsaw puzzle, the hours spent annotating fly by and I often want to untangle just one more enigma or finish one more letter before breaking for lunch. One of the ironies of working with the Hutchinson Papers is, of course, that I am not the only person who wanted to read Thomas Hutchinson’s mail. Many of his contemporaries were convinced that he had maligned them in his letters or misrepresented loyalties of his key political opponents. If it were not for such misrepresentations, how was it that ministers (if not the king himself) could fail to understand their concerns about the Stamp Act or other objectionable legislation, which lay so clearly within the consensus of Whig politics that dominated in England in the years following the Glorious Revolution of 1688? The essence of the argument between Britain and her colonies lay in the colonial understanding that the charters granted at the time of settlement were contracts which neither party could alter without the agreement of the other. But for Hutchinson, if one of the parties to a contract is the king himself (or the king-in-Parliament), any charter could be revoked or altered by the royal will. The administration of Francis Bernard (Hutchinson’s predecessor as governor) collapsed when several of his letters to British officials were published in the Boston newspapers in the spring of 1768, and a similar fate awaited Hutchinson six years later, when a series of his letters (stolen from the files of a deceased correspondent and transmitted to the Massachusetts General Court by Benjamin Franklin) appeared in print. It is true that one of the letters contained the very unfortunate phrase “there must be an abridgement of so-called English liberties!” If this small handful of letters contained such a smoking gun, what other indiscretions and libelous remarks must his letter books contain? Before he left for England in June 1774, Hutchinson transferred his letter books to his country house in Milton for safe-keeping. That proved a very bad decision, since the Milton house lay across the American lines during the Siege of Boston. They were seized by the Massachusetts Committee of Safety as soon as they were discovered and have remained the property of the Commonwealth ever since. The Rev. William Gordon of Roxbury began a highly emended publication of some 150 letters beginning in the Boston Gazette on 5 June 1775. Since those letters seemed to confirm what everyone already wanted to believe about Hutchinson, there seemed little need to check the context of Gordon’s work. Thus, Thomas Hutchinson became the dissembler and “Wicked Statesman,” and remained so, until Freiberg and Mayo began the lengthy task of unlocking the content of his letters in 1954. 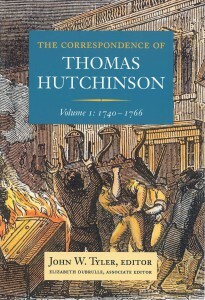 Hutchinson’s rehabilitation became complete with the publication of Bernard Bailyn’s Ordeal of Thomas Hutchinson (1974). The publication of his most relevant political correspondence, beginning with this volume, should enable some readers to become better acquainted with the man himself, unfiltered by the jealousies of his enemies, and to join the slow unwinding of the patriot movement in Massachusetts in Boston as it appeared to one particularly well-placed but unsympathetic observer. To comment on ….. “there seemed little need to check the context of Gordon’s work. 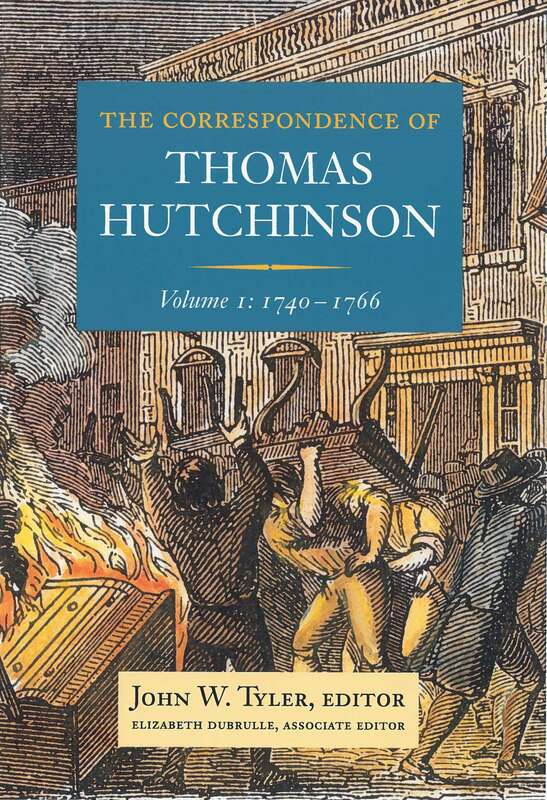 Thus, Thomas Hutchinson became the dissembler and “Wicked Statesman”. The selective and biased alteration of fact was as common than as it is now. And I wonder if New England historians shall ever redeem, one of their most maligned, that is Sir Edmund Andros. Rather amazing or amusing to see his full length portrait on display in the Connecticut State Offices in Hartford ! I love your analogy of working a jigsaw puzzle. I’m part of a group in my retirement home who call ourselves the “Woodies.” We put together wood jigsaw puzzles for which we never see the picture until it emerges as we finish the puzzle–no box to look at.That makes your analogy even more complete, as you didn’t have any idea what you would find until you’d transcribed the sequence of letters. We often find ourselves saying we need to go get something else done, but we can’t make ourselves leave the puzzle table. The puzzle is just too compelling. It’s also a great intellectual challenge, as I’m sure those letters were. Thank you for that analogy, along with a great story!